The speed dating event featured on Mel and Joey took place at the Summit Lounge of Holiday Inn. Last February 8, Mel and Joey explored the unconventional side of singlehood by attending a pre-Valentine's mixer at the Summit Lounge of Holiday Inn. Partners Mel Tiangco and Joey de Leon featured the speed-dating event on the February 10 episode of their show. Daring and Dateless is the name of the speed-dating event organized by Six Degrees Events. Speed dating is an uncommon dating practice where participants are made to sit together at an intimate venue where they are allotted a certain time to get to know each other. A moderator blows the whistle when the time is up and the guests move on to the next partner. "Targeted specifically for singles. It's not like [when] you say Valentine's, ah couples. So parang mga singles na, wala naman akong kasama. So for us, we don't want them to think na wala kayong puwedeng gawin. This is an avenue for you to meet new people," says Marian Macapanpan of Six Degrees Events. How is speed dating conducted? "Everyone comes in; they register, so we have their list. We give each one a sticker label with a number, with that number is a corresponding table or station. We ask the girl to sit down and we explain that you are given three minutes to talk to each other. It starts with girl one and boy one on table one. After three minutes, we blow the whistle and we say ‘Before you move, please tick the card if it's a yes or no.' It goes around until everyone finishes," continues Marian. What if the guests like more than one person? "We don't restrict people to just choose one. You can check as many as you want. [For example], I tick one but he didn't tick me. There's no information exchange. We only give the name, email address and cell phone number if there's a match." Stephanie Perez, one of the participants, thinks speed dating is not only for finding Mr. Right. "I was encouraged to attend speed dating, it's not just about [meeting] the potential boyfriend or girlfriend, but basically makakakilala ka ng new set of friendsthrough speed dating." The intimate singles party is set about a week from Valentine's Day to give the participants ample time to get to know their matches for the big day. The event started at around 8:00 pm and lasted for one to two hours. Daring and Dateless is just one of the many speed dating event series in Six Degrees Event's roster. 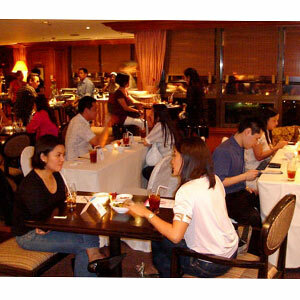 Other events lined up are: Fil-Chi exclusive for the Filipino Chinese community on February 16 at Xin Tian Di and March 8 for Wine Lovers at Bar One. For more information, please log on to http://www.sixdegreesevents.com/.